Logic Is Ready To Tell The World Who He Is The son of a black father and a white mother, Logic says he was "born to make" his new album, Everybody. On it, he confronts issues of identity he says he's been scared to rap about in the past. Logic's new album, Everybody, is out now. Sir Robert Bryson Hall II, better known as Logic, grew up in poverty in suburban Maryland. His dad was addicted to drugs, and his mother flung racial slurs at her biracial kids. But that tough upbringing seems a world away now. 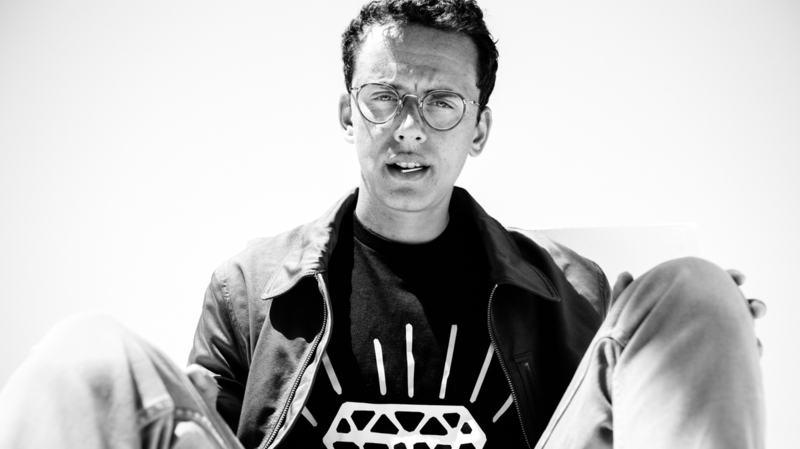 Today Logic, 27, lives in a sprawling home outside Los Angeles, complete with a basement studio. The rapper's star has been rising rapidly in the hip-hop world; his new album, Everybody, debuted atop the Billboard 200. With songs like "AfricAryaN" and the title track, Everybody confronts the challenges with identity that Logic experienced growing up. His mother is white and his father black — and among his seven biracial siblings, Logic looked the most white. "It wasn't until I went on into the world [that] people would be like 'Oh, you cracker, you white boy, you this, you that,' and I didn't understand," he tells NPR's David Greene. While his music makes it clear that race is on his mind, Logic says that, in interviews, he's never the first to bring the topic up. "It's always somebody that's like, 'Oh, what's it like being a white rapper?' " he says. "And then I have to explain to them, like, no, I'm actually black and white. I'm biracial. Just so you know. Let's move on." Given his background and the violence he saw in his childhood, Logic believes he was "born to make this album." Still, he acknowledges that it's difficult to express his thoughts on matters of identity in his music. It's something he says he's been scared to rap about in the past. "It's scary to say, 'This is who I am,' and the world goes, 'No, you're not,'" he says. "You know, 'You haven't experienced that, you didn't grow up like this.' "
One track on Everybody, "America," has attracted attention for the way it seems to condemn Logic's fellow rapper Kanye West. But Logic wants to make it clear he's got no beef with West, whom he considers an idol. He just wishes West would speak out the way Logic remembers he once did. "[In] 2005, Kanye West called out George Bush and said, 'George Bush doesn't care about black people,' " Logic says. "And that's how the community felt at that time, with what was going on with Katrina — it was horrendous. And you have Kanye, who dared to stand up and say how he felt. And here we are, 12 years later, and he's not really being that voice that we know him as." After struggling with homelessness, working multiple jobs simultaneously and supporting himself for years, the rapper who's constantly reckoned with his identity seems to have found it in music. "People say, 'What would you do if you didn't do this?' And to be quite honest, I'd be dead or in jail or I'd be a drug addict," he says. "That's what was laid out for me, period, unfortunately. I used to have nothing to lose, so that's why I would go as hard as I did — because I had nothing to lose and I had everything to gain."